Newark Central School’s 3rd through 12th grade vocal musicians once again sang their hearts out March 19th to the audience in the packed Newark High School auditorium where, again this year, it was literally standing room only. And since there were so many people in the auditorium, some stood outside in the hallway to watch the “Festival of Song” concert. – The combined Kelley School Grades 3-5 choruses directed by Kelley School vocal music teacher Libby Brozik. 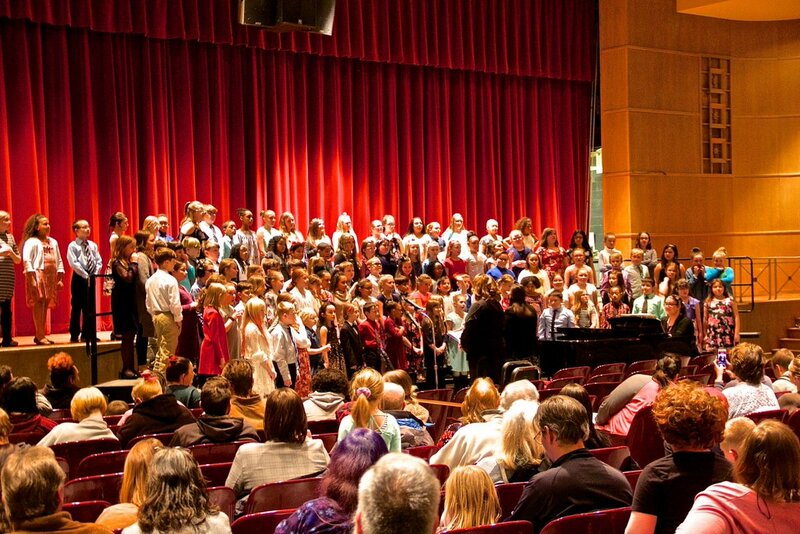 – The Newark Middle School 7th and 8th grade choruses directed by NMS vocal music teacher Lisa Clark. – The NHS Mixed Choir and the NHS Chamber Choir directed by Flock. Brozik gratefully noted NHS vocal music teacher Kate Flock had worked with her choruses at Kelley School each morning for an hour January through early March while she was on maternity leave. Flock later said she was really pleased with the concert and the size of the audience. Kyle Bliek, the new NSCD Broadcast TV/Social Media coordinator, videotaped the event in the auditorium so it could be live streamed on the NHS You Tube channel and Facebook page.